For the last few years the sit and stand stroller has been a popular choice for parents who have 2 children of different ages and abilities. 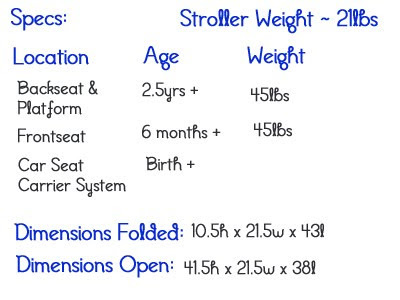 It’s practical design makes use of the area at the back of stroller, offering a second seating option with a 3-point harness for an older child who may be able to walk on their own but not for long periods of time. It also has a platform that can be used as a board for your pre-schooler(up to 45lbs) to stand on while they ride along with you. 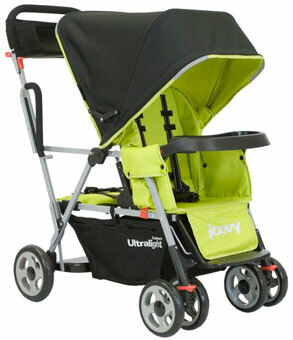 Baby Gear company Joovy has designed 4 strollers that offer the sit and stand feature. We recently had the opportunity to test out their popular Caboose Ultralight. Installation: Setting up the stroller was fairly straight forward. While the front wheels and canopy were easy to pop on, the back wheels looked as though they may be a challenge. To make it easy, Joovy includes a manual that walks you through every step to ensure a successful installation. Getting started is a breeze. To open the stroller all that is needed is to pull up on the handlebar. Once in place there is a lock mechanism on the left hand side to keep the frame in place while in use. Because the Caboose Ultralight weighs just 21lbs, it pushes quite nicely. Like a standard travel system it has a full seat in the front complete with snack tray and a adjustable 5-point harness with an attachment to hold an infant car seat. With just the addition of this bracket (provided), most infant car seats that have a seat belt pass through can be placed in the front, making this stroller perfect from birth. New for 2010 Joovy has also added a third recline position for the front passenger. 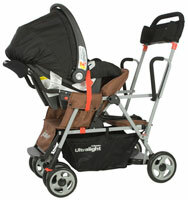 While its not a completely flat recline, it is more than enough for a younger child to sleep comfortably while out. 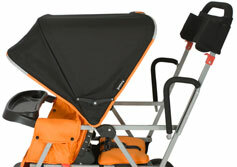 The Joovy Caboose Ultralight is smartly designed. The front of the stroller resembles a standard stroller, while the back makes room for an older child. They can choose to sit on the small bench if they are tired or stand if they just need a quick ride from one stop to another. Because my son is used to a double side by side, he wasn’t quite sure what to make of the back seat at first. For me it was a bonus that my boys were back to back. As they get older shopping has become a bit of a challenge when they sit side by side because they fight. 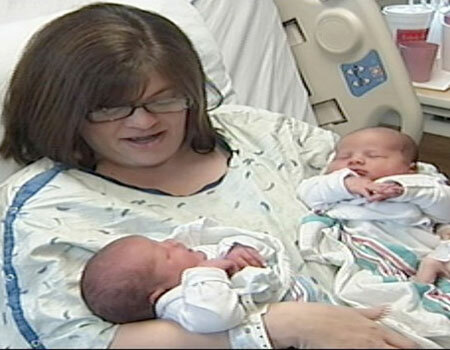 Having them back to back reduced that a bit and allowed me to have a good eye on what my older guy was up to. A centrally positioned canopy ensures that both kids get good coverage. When the back seat is empty it can moved completely forward to fully shade the front passenger or just closed in the center position when out shopping. I actually use it to hold whatever I am buying when at the mall or market. The scoop that is created when it is half closed is great for holding onto little shirts and pants. I also figured out that a standard grocery shopping basket can be placed in the back where the bench is if you are out for a quick grocery shop with just one child. My ‘ah-ha’ moment saved my shopping trip and allowed me to peruse the grocery store without having to balance the basket and push the stroller. 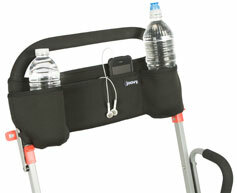 Also for your convenience Joovy has included their neoprene Parent Organizer with the Ultralight Caboose. This awesome handlebar storage unit gives you a place to store 2 sippy cups, your keys, cell phone and money. It fits snugly across the handlebars and is positioned perfectly for quick access. The Joovy Caboose Ultralight($269) is a practical option for parents who are looking for something that will grow with their family for a reasonable price. During our test we took the Caboose Ultralight everywhere (mall, park and market) and it performed well under all of the conditions. It will be great to take to the amusement parks this summer and would also be a great travel stroller as it folds up nicely and can be locked with a lever located on the side.